FDI stands for “Foreign Direct Investment”. Why do we mean by foreign direct investment? As the name suggests, it is an investment by foreign individual(s) or company(ies) into business, capital markets or production in the host country. Foreign direct investment policy in India is regulated under the Foreign Exchange Management Act (FEMA) 2000 administered by the Reserve Bank of India (RBI). FDI plays an important role in the economic development of a country. The capital inflow of foreign investors allows strengthening infrastructure, increasing productivity and creating employment opportunities in India. Additionally, FDI acts as a medium to acquire advanced technology and mobilize foreign exchange resources. Availability of foreign exchange reserves in the country allows RBI (the central banking institution of India) to intervene in the foreign exchange market and control any adverse movement in order to stabilize the foreign exchange rates. As a result, it provides a more favourable economic environment for the development of Indian economy. But Why Do We Need FDI? FDI is the major source of foreign exchange inflow in the country. It offers a supreme benefit to country’s external borrowings as the government needs to repay the international debt with the interest over a particular period of time. The inflow of foreign currency in the economy allows the government to generate adequate resources which help to stabilize the BOP (Balance of Payment). For the development of an economy, it is important to have new technology, proper management and new skills. FDI allows bridging of the technology gap between foreign and domestic firms to boost the scale of production which is beneficial for the betterment of Indian economy. Thus, FDI is also considered an asset to the economy. FDI allows foreign enterprises to establish their business in India. The establishment of these enterprises in the country generates employment opportunities for the people of India. Thus, the government facilitates foreign companies to set up their business entities in the country to empower Indian youth with new and improved skills. Foreign companies carry a broad international marketing network and marketing information which helps in promoting domestic products across the globe. Hence, FDI promotes the export-oriented activities that improve export performance of the country. Apart from these advantages, FDI helps in creating a competitive environment in the country which leads to higher efficiency and superior products and services. The Indian government has initiated steps to promote FDI as they set an investor-friendly policy where most of the sectors are open for FDI under the automatic route (meaning no need to take prior approval for investment by the Government or the Reserve Bank of India). The FDI policy is reviewed on a continuous basis with the purpose that India remains an investor-friendly and attractive FDI destination. FDI covers various sectors such as Defence, Pharmaceuticals, Asset Reconstruction Companies, Broadcasting, Trading, Civil Aviation, Construction and Retail, etc. In the Union Budget 2018, the cabinet approved 100% FDI under the automatic route for single-brand retail trading. Under this change, the non-resident entity is permitted to commence retail trading of ‘single brand’ product in India for a particular brand. Additionally, the Indian government has also permitted 100% FDI for construction sector under the automatic route. Foreign airlines are permitted to invest up to 49% under the approval route in Air India. The main purpose of these relaxations in foreign investment by the government is to bring international best practices and employee the latest technologies which propel manufacturing sector and employment generation in India. To boost manufacturing sector with a focus on ‘Make in India’ initiative, the government has allowed manufacturers to sell their products through the medium of wholesale and retail, including e-commerce under the automatic route. According to Indian Brand Equity Foundation (IBEF), the total FDI investments in India during April-December 2017 stood at US$ 35.94 billion as the government has been providing relaxation on FDI which is attracting a large number of foreign investments. Moreover, the Telecommunications sector has attracted the highest FDI equity inflow during April-December 2017, i.e. US $ 6.14 billion, followed by computer software and hardware sector at US$ 5.16 billion & Services at US$ 4.62 billion. The total FDI equity inflows for December 2017 reached US $ 4.82 billion. During the period of April-December 2017, India gained maximum FDI equity inflows from Mauritius, i.e. 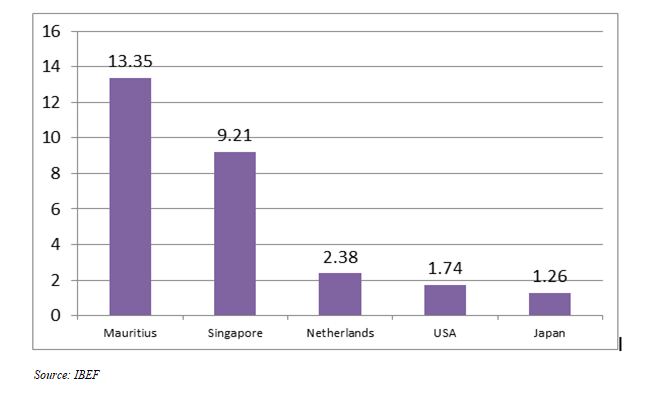 US$ 13.35 billion, followed by Singapore (US$ 9.21 billion), Netherlands (US$ 2.38 billion), USA (US$ 1.74 billion), and Japan (US$ 1.26 billion). Foreign companies invest in India to take benefits of relatively lower wages, special investment privileges like tax exemptions, etc. Hence, India is one of the top gainers of FDI. February 2018- IKEA declared its plan to invest approximately US$ 612 million in the Maharashtra state in order to establish multi-format stores and experience centres. December 2017- DIPP (The Department of Industrial Policy & Promotion) approved FDI proposals of Supr Infotech Solutions and Damro Furniture in the retail sector. November 2017- In the state of North-East region of India, 39 MOUs (Memorandum of Understanding) was signed for the investment of US$ 612-765 million. Thus, we can say that FDI plays a crucial role in the growth of Indian economy as it helps to bring new technologies, employment generation and improvement in business operations, etc.